This vintage 1933 American Studebaker is believed to be the only one of its type in the country, she spent the first 50 years of her life in South Africa. 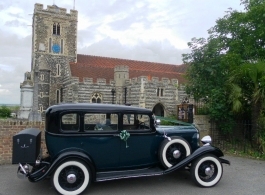 You will certainly turn heads when you arrive at your wedding in this magnificent American wedding car. Ribbons, bows and a bottle of bubbly for the bride & groom are inclusive.